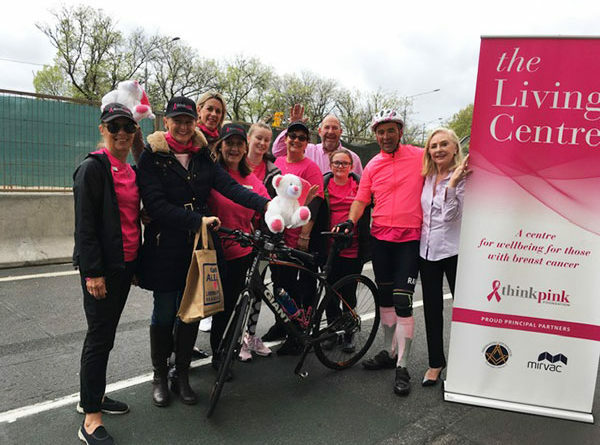 Martin Howley, a fifty-year-old Irishman who lost his mother and sweetheart to Breast Cancer, arrived in Melbourne and was welcomed at The Living Centre on Thursday morning after riding from Sydney as part of a 4,343 kilometre fundraising ride in support of the Think Pink Foundation. Martin will start riding the 763 kilometres to Adelaide on Saturday morning. Martin said he expected to finish the ride, in honour of his mother Claire and girlfriend, on Sunday 28 October 2018 in Perth. The ride has been timed for the month of October – Breast Cancer Awareness month.